William Brown married Martha Basset May 28, 1767 Charles City Co., VA or Charleston, SC. His will was filed April 1805, Knox Co, TN, Wife Martha. Exec long trusted friend Samuel Sample, Joseph McCullough. He gave 3 slaves to wife, one each to daughters plus $10 each. Ellihu Brown b 1798 d 15 Apr 1862 m Jane Brockus Apr 1822 Knox Co., TN, co signer Guyan Brown. He appeared in census, Putnum Co. In 1830, Montgomery Co. 1840, Boone Co. (Thorntown) til death. 3. Joseph Allen b 1833 Tipp Co.
(1) Rebecca Brown was born 1764 in NC and died July 22 1849, buried in a cemetary in Missouri. m. James Harrelson (b 1759 aft 1829 TN) in 1782. She moved to Green Co., MO and perhaps her son married a daughter of James Leeper. (4) Thomas Brown died 3 Sep 1849 at the age of 96, leaving the following children and only heirs: William Brown, Alexander Brown, Rebecca Brown, Margaret Hall, Nancy McGregor. Of these, only William Brown appeared to be present at the 1850 census. Rebecca Brown had moved to Missouri. She had married a Daniel Brown; I do not know the relationship. Note that Thomas' will did not name heirs of any children, so that may be a complete list of ones who survived to adulthood. (6) Thomas' brother Robert Brown also died in 1849, and his estate was divided between Rebecca McMahan (wife of Jonathan McMahan and present at the 1850 census), the nine heirs of William Brown (I have identified only Nathaniel, Redman, Jane the wife of Stephen Banks, and my direct ancestor John), and the nine heirs of Margaret Isbell (had moved to Alabama). (8-6) John Brown, son of Felix C & Jane, was born 27 Apr 1797 in Knox Co., TN. He married Elizabeth "Betsey" Sample (daughter of Samuel Sample and Elizabeth Heazlet) on 21 Nov 1816 in Knox County. Their son, Gideon Leeper Brown was born 25 Jun 1821 in Knox County. John died on 2 Oct 1842 in Andrew, MO and his wife Elizabeth 30 Jun 1866 in Mt. Vernon, MO. 2. John J. b 1820 Knox Co., TN. Samuel Sample, born in Sept 2, 1754 in Augusta Co., VA. He was a revolutionary war vet that drew a pension in Knox Co., TN in 1832. The son of William and Margaret Sample. His wife was Elizabeth Heaslet b 1754? m 1790? Her parents were William Heaslett and Mary Clark. Elizabeth "Betsy" Sample married John Brown in Knox Co., TN in Nov. 21, 1816. William Sample m Catherine Kerr/Carr. (8-6-3) Gideon Leeper Brown, son of John & Elizabeth, was born 25 Jun 1821. He married Ann Blakely on 14 Jun 1842 in Andrew, MO. 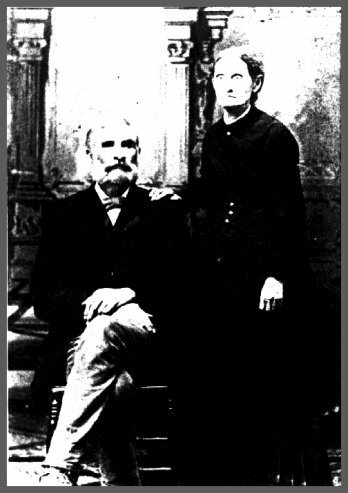 Ann ( covered in Blakely history) was born 20 Jun 1823 in Knox, TN and died on 20 Aug 1906 in Foyil, OK. We have a photo of Gideon and Ann taken in Mt. Vernon, MO »«. 9. Nancy C. b 11 Jun 1863 d 15 Oct 1894 Foyil, I.T. (OK) Wards Grove Cem. Brown, KS at the age of 62 or 63. He married Margaret Jones (b 20 Dec 1842 Buchanan, MO d 8 Jan 1916 Brown, KS) on 3 Apr 1867 in Buchanan, MO. (8-6-3-1-1) Sell Leeper Brown, son of John C. & Margaret, b 26 Apr 1868 Pleasant Hill, MO, d 26 Feb 1935 Parker, SD m Bertha Gage. (8-6-3-1-2) Josiah Brown, son of John C. & Margaret, b 22 Aug 1870 Buchanan, MO d 1 Sep 1962 Wamego, KS. He married Catherine Anastatia (La Fontaine) Brannick, daughter of Michael and Mary Ellen (Ryan) Brannick, on 9 Nov 1915 Wamego, KS. Woodbine, KS. Her next marriage was to Melvin Wilson 22 Jan 1973 Las Vegas, Clark, NV. (8-6-3-1-2-2) Roberta Hazel Brown b 30 May 1919 Wamego, KS. She married Marshall Allen Brewer 22 June 1945 Wamego, KS. (8-6-3-1-2-3) John Pershing Brown b 3 Nov 1921 Wamego, KS. He married Evelyn Jean Boseck on 6 Sep 1953. Evelyn supplied much valuable information on the Browns, Blakelys and Pattons for this family history. (8-6-3-4) Gideon Leeper Brown, son of Gideon L & Ann, b 23 May 1852 Andrew, Nodaway Co., MO d 20 Jan 1951 in Tulsa, Ok & is buried at Hillside Cemetery next to his wife & daughter. He married Cora Minnie Landrum (born 20 Jun 1872 in Missouri), dau of John Lanham and Sara Ann Gist Lanham. She died 3 Jun 1935 at Skiatook, Ok and is buried at Hillside Cemetery. 1. Ada Annie b 16 Jun 1893, Foyil, Cherokee Nation, Indian Terrority; d 29 Jul 1980, Tulsa, Tulsa Co., OK; m ARTHUR V. HAAS, 27 Dec 1913, North Muskogee (Okay),Wagoner, OK.
(8-6-3-11) Sterling Price Brown b 20 Oct 1865 Buchanan, MO and d 23 Jun 1933 Buchanan, MO. He married Ethel Elizabeth Cherry 11 Nov 1897, they later separated. (8-6-3-12) Robert Lee Brown b 6 Jan 1869 and d 27 May 1939 in Binger, Ok. He married Mary Garner. (8-7) Gideon Leeper Brown, son of Felix C & Jane, was born in 1800 and died on October 29,1858. He came west with his father as a boy and located at Knoxville, Tenn. where he was reared to manhood. He married Matilda Patton, (b 18 Dec 1814 Strawberry Plains, Knox Co., TN) on January 20,1830. He removed from Tenn. in 1831 and became one of the pioneer planters of Jackson Co., MO. Subsequently he moved to Platte and Buchanan counties. He was a man of shrewd business judgement, energy and enterprise and was considered one of the most successful planters in the locality. In 1854 he visited what is now Kansas, at that time still known as Nebraska territory, and took up land about eight miles west of Leavenworth, but never removed to Kansas. In 1856 he sold the land and continued his activities in farming in Buchanan County, where he had many friends. He was actively interested in politics but never aspired to hold office. He was a Democrat, a large slave holder sympathized with the pro-slavery party. Gideon and Matilda had 7 children. In his will dated 12 Oct 1858 Gideon stipulated who would inherit specific slaves and that Matilda would inherit his estate except if she remarried, in which case it would go to Felix C. Brown. Gideon died 29 Oct 29 1858 shortly after the date of this will and Matilda lived until 7 Feb 1902, at which time she died in Brown Hospital, Salt Creek Valley, Leavenworth KS at the home of her son Felix, who at that time owned the hospital, a home for the insane. She is buried in Mt. Muncie Hospital, Leavenworth, KS Sec 26, Lot 209, Grave 1 on the Felix Brown lot. There is no stone. She married James Pennington in 1860 so we assume the estate went to Felix at that time. She died 7 Feb 1901 in Brown Hospital, Salt Creek, Valley Leavenworth, KS and was buried at St Muncie Cemetery, Leavenworth. (8-7-6) Felix Canada Brown son of Gideon L & Matilda, was born 13 Aug 1843 in Buchanan, MO and died 21 Aug 1927. He was buried in Mt. Muncie Cemetery. He was reared upon his father's farm and at the age of nine years accompanied his father on a trip to the present state of Kansas and remembered the stirring times of the border warfare. Prior to the Civil war Felix C. Brown was engaged in over-land freighting on the Oregon trail. When only 14 years old, He was a teamster in the outfit of General Sydney Johnston on his expedition from Fort Leavenworth to Salt Lake City, just prior to the outbreak of the war. The party spent the winter at Fort Bridger and nearly starved to death for lack of provisions. Soon after this he began to freight from Leavenworth, for Russell Majors & Waddell, who held a contract to supply food to the Army at Forts Laramie, Bridger, Kearney, Bents and Union. He enlisted in the Confederate Army at the outbreak of the Civil War at age 18, joining a company of dragoons under Governor Jackson. After a short time he became a member of the First Missouri Light Artillery and was assigned to Colonel Gates regiment. He was wounded in a skirmish near Newtonia, MO and a battle at Jenkins Ferry but neither time seriously. He took part in all the battles west of the Mississippi River in which the department of the Mississippi participated with the exception of the battle of Elk Horn. After the surrender of General Lee and the downfall of the confederacy in April 1865, he returned to his native county. He farmed on the old homestead there for 7 years. In 1872 he settled in Atchison County for 8 years then returned to Missouri. From there he came to Leavenworth county to take charge of an asylum, known as the Maplewood Asylum, for a year. He engaged in the mercantile business in Leavenworth for four years, then in 1889 he erected a private sanitarium and asylum, Elmwood Hospital. On February 15, 1866 he Married Jincy A. Blakely »« (1848-Oct 30,1938) Mr. Brown was a democrat taking active part in the affairs of Leavenworth City, County and State. For two years he served as trustee of Walnut Township, Atchison County. (Jincy's father, Felix Blakely died Dec 13,1915). (8-7-6-3) Thomas J. Brown, son of Gideon L & Matilda, (b 30 Oct 1870 d 11Oct 1955) married Anne Tascheta, daughter of Peter Tascheta on 19 Apr 1899. (8-7-6-3-2) Thomas J. Brown Jr., son of Thomas J. & Ann, was born abt. 1904 Leavenworth, died 1983-1985 Wanda Joyce (Cora's granddaughter) has a copy of Gideon L. Brown's will and an old double barreled shotgun he owned. In the late 1970's Wanda received an inheritance from the estate of Jincy A. Brown, which was being administered by her cousin, Mr. Thomas J. Brown Jr., Brown & Wyrick, 408 1/2 Delaware Street, Leavenworth, Kansas 66048. Wanda corresponded with Thomas J. Brown Jr. in August 1983 when she began compiling information on her family tree. Thomas indicated he would go through the records he had and see if he could enlarge on them. Some time after that he passed away Wanda received a final settlement from the estate of Jincy A. Brown in August 1987. administered by Thomas Brown Jr's surviving partner Austin N. Wyrick. 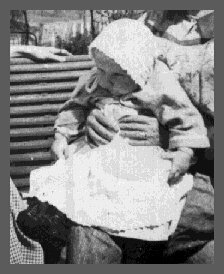 (8-7-6-4) Cora Matilda Brown »«, dau of Gideon L & Matilda, was born 20 Dec 1872 and died 30 Jan 1940. She and Arthur Lloyd Land were married by Rev. W. N. Page on 8 Dec 1897 at Leavenworth, KS. She was Wanda Land Joyce's grandmother. Arthur Lloyd Land was born 20 Dec 1872 in Patrington, England. and died 30 Jan 1940 in Sherman Oaks, CA. He spent a number of years in Texas and was living in CA at the time of his death in 1940. Arthur and Cora had two children. (8-7-6-4-1) Felix Clifton Land, son of Arthur L. & Cora, was born 5 Oct 1898 in Leavenworth KS, and died in Las Vegas, NV on 14 Nov 1959. He was married to Gladys Louella Schwartz (b 27 July 1904) on 15 May 1925 in Manhattan Beach, CA. Felix was a carpenter by trade and later moved to California. He worked at Warner Brothers as a set builder, then went in to partnership with Archie Roscoe under the name of Roscoe & Land. Roscoe and Land were quite active in the Southern California area. They built El Toro marine base, a number of schools and many movie stars homes in the Bel Air area, including Judy Garland and Hedy Lamarr. They lived in Sepulveda and later built a home on Sherman Oaks Avenue in Sherman Oaks. They had two daughters. In 1947, they moved to Douglas, AZ and built the frontier village there, where Wanda met her husband to be- Clint Joyce. The following year they moved to Tucson, AZ and built Frontier Village there. They moved to Las Vegas, NV in 1950 and built an apartment house and motel there. Felix retired briefly then accepted a position with the State Contractors Board, where he worked until the time of his death. Felix was a Mason and an active shriner, having gone in to the Shrine at the age of 21. He attended all three of Clint Joyce's masonic degrees in San Diego and willed his York Rite shrine ring to Clint. He said that a relative, Frank Land, founded the Order of De Molay. We know that Frank Sherman Land was the son of William Sherman Land and Elizabeth Lottie Sampson but have not connected William Sherman Land to Dr. Fullarton Land's family. Felix had also said that he was a distant relative of Charles Lindbergh There does appear to be a great deal of resemblance between the two men in their youth. We have traced Lindbergh's lineage and found that his mother was Evangeline Lodge Land and have traced his ancestry to Robert Land, who was born in 1736 in New York, but have not tied that in to Dr. Fullarton Land's lineage either. There was a card in the family Bible from Mr & Mrs Edward Land dated 1894-5 presumably another relative from England, but we do not know his lineage either. Felix loved to fish, go to baseball and football games, and have a good time. In his early years he and a cousin, Ernest owned a gambling casino. Felix had a great sense of humor and was a man's man. He enjoyed traveling by car but did not like flying or cruising. (8-7-6-4-1-1) Beverly Jeanne Land was born in Glendale, CA on 27 May 1929. She is the sister of Wanda Land Joyce. Beverly was married to Jim Jefferies, a fighter and the nephew of the championship fighter Jim Jefferies in Las Vegas, NV about 1954. They had no children and were divorced about a year later. She married Glenn Dee Terry (b 25 Feb 1935 Moultin, AL) in Las Vegas on 17 July 1957. They had a son, Keith Douglas Terry, b 4 May 1958. Glenn was in the Marine Corps for several years after they were married. Following service in Jacksonville, Florida, Okinawa and the Phillipines, he located in Las Vegas, NV and operated a concrete company until a heart attack forced him to retire. Following several years of recuperation in California and Arizona after open heart surgery, Bev and Glenn moved to Hayti, MO. They were divorced about 1989 and Beverly took a position as secretary to the church in Hayti. Keith married Lonnie and had a son named Anthony Keith Terry born on 6 Sep 1981. They were divorced and Keith married Robin and they had a daughter named Amber Marie, born in Las Vegas about 1986. Keith and Robin also divorced. Keith is an accomplished musician but does not work at that trade. He is employed by an air conditioning firm. Joyce on 7 Dec 1951 in Tucson, AZ. The family moved from San Diego to San Francisco in 1957 and to Boise, ID in 1968. Boise provided the family with a small town atmosphere similar to what Clint and Wanda had known in Douglas, AZ. Cliff and Lani took advantage of skiing, driving a car at age 14, and the general freedom found in a small town wholesome environment. Cliff was involved in De Molay and Lani in Job's Daughters, serving as Honored Queen. Wanda's life dream growing up in a family in the construction business and seeing so many beautiful homes was to build a dream home. Following retirement Clint and Wanda built a spacious country french home on the Boise River in an area called Woods Island -Riverside Village. The home was designed by Wanda and turned over to an architect for scaling and final design. Clint was raised to Master Mason on 31 July 1952 on Wanda's birthday in Crossroads Lodge in San Diego, accompanied by Wanda's dad, Felix Clifton Land. He took his Royal Arch and Commandery degrees in Palo Alto, CA in 1962 and became a Shriner in El Korah Lodge in Boise, ID in 1969. He belonged to the Players unit of El Korah, which put on many melodramas and did the ceremonial work and served as President of the unit. Wanda was active in the Daughters of the Nile and was Directress of the Dancers unit for many years. Lani joined her mother as a Daughter of the Nile and a Dancer and the family obtained many pleasures from their Masonic affiliations. Wanda's artistic talents. zest for life, skill as a decorator and homemaker created a fertile atmosphere for the creative development of Cliff and Lani which further enriched the joys of the Boise Joyces. (8-7-6-4-1-2-1) Clifton Claude Joyce Cliff and Lani both graduated from South Junior High, and Borah High School. Cliff attended Boise State as an art major for two years while working in an Albertsons grocery store. He then spent three years at Cal Arts in Valencia, CA. This school was founded by Walt Disney. Cliff graduated in 1979. He married Karen Famillian on 10 Jun 1979. Shortly thereafter they moved to Northridge, CA. Cliff and Karen gave birth to a daughter, Ashley Sarah Joyce, on 30 Aug 1983. Their second daughter, Chelsea Rose was born 6 Oct 1987. Cliff and Karen moved from Northridge to Woodland Hills after Chelsea's birth. Cliff started his own company, Artword Graphics just prior to graduation. Both Cliff and Karen worked many long hours to keep the Company growing. They specialized in graphics art, design work, electronic typesetting and advertising layout work. After a couple of years, they merged with a printing Company to form Artword Granada, which was located in Chatsworth, CA. Cliff bought an Apple ][e computer and became quite competent working with microprocessors both as a hobby and in his business. When the Apple Macintosh Computer was introduced Cliff bought one and tried his hand at developing a graphics software package. He developed one Called Mac The Knife, that was published by Miles Computing and immediately gained prominence on the Softsel Hot List. Cliff sold out his interest in Artword Granada and developed a second Volume of Mac The Knife, a collection of type fonts, which also sold well. When the Publisher failed to make royalty payments to Cliff, Cliff started his own publishing Company, which he named Dubl Click. He developed a number of products in this company including, Calculator Construction Set, World Class Fonts, Wet Paint, Pro Glyph, Mac Tut, Click Change and Menu Fonts and Go Figure, one of the first new products for the Apple Newton. One experience Cliff and Karen did not relish was living through a 6.6 earthquake on 17 Jan1994 which severely damaged their home but fortunately did no bodily harm to the family. Their 3rd daughter was born 31 May 1996 in Bend, OR. (8-7-6-4-1-2-2) Lani Caprice Joyce received her Business Degree from Boise State in 1978. She was first runner up in the Miss Boise pageant and received scholarships for two years at Boise State. She was Honored Queen of her Bethel in Job's Daughters. She worked part time at a dress shop while in College. Upon graduation, she worked at Albertson's Credit Union to gain business experience while searching for a career position. She then joined Farm Bureau Insurance Company as a Claims Adjuster. She gained much recognition during the four years in Claims. In early 1983 she entered sales and was shortly promoted to Division Manager of the Boise office of Farm Bureau. She married Gary Denniston on 12 Jul 1986. She joined First Security Bank to help start their insurance department in January 1987. Lani and Gary moved to Richland, WA in early 1988. Lani accepted a position there and was made an investment officer selling annuities and investments for the bank U.S. Bankcorp and received the top sales award for the state of Washington in 1991. She was named Vice President in January 1994. Gary had three sons from a previous marriage, Anthony Scott 20 Nov 1968, Timothy Glenn 16 Jul 1971 and Sean Patrick 5 Apr 1978. Clint and Wanda were delighted to gain three such nice grandsons from Gary and Lani's union. (8-7-6-4-2) Arthur Lloyd Land Jr., son of Arthur L & Cora, was born 22 Feb 22 1905 in Leavenworth, KS and died 27 Sep 27 1968 in Los Angeles, CA. Lloyd did a tour of duty in the US Navy and was married to Ruth Fay Brown but they never had children. (8-7-6-5) Maude Divine Brown, dau of Gideon L & Matilda,was born 14 Feb 1875. She married Charles Masterson on 30 Jan 1899 at Leavenworth, Platte Co., KS. Maude was operating the Encino Ritz Motel when Clint and Wanda Joyce visited her in the early 50s. Maude's husband died on 30 Oct 1937 and she died in Los Angeles, CA in the late 1950s. They had two children. 2. Charles F. b 14 Feb 1905, d 30 Nov 1937. (8-7-6-5-1) Ruth Ann Masterson was born 17 Sep 1902. She married Elmer H Schroeder and her cousin Arthur Lloyd Land married Elmer's sister Ruth Fay. Elmer died of a heart attack in the San Fernando Valley in the late 60's or early 70's and Ruth relocated in Las Vegas, where she died a few years later. They had no children. (8-7-6-6) Felix Leonard Brown, son of Gideon L & Matilda, was born 4 Mar 1877 and died 25 Dec 1927. at age 50 in an automobile accident. He was married to Dora. Richard was in the auto with Leonard but was not hurt. In May of 1992 Wanda found the address of Leonard & Ruby Brown on a Christmas card they sent her mother in 1991. They were living in Leavenworth, KS but we have not heard from them since we wrote them in June. We located Evelyn J. 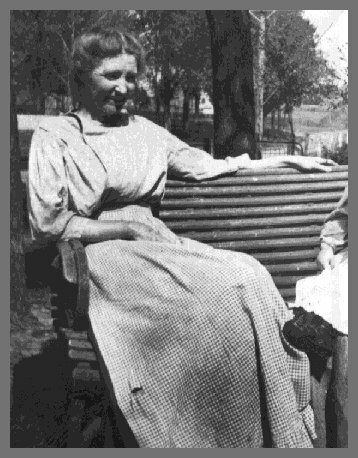 Brown of Manhattan Kansas through submissions to the LDS History files and obtained much additional valuable information on the Brown family from her. (8-7-6-7) Gideon August Brown, son of Gideon L & Matilda, was born 30 Jun 1880 in Kansas and died 28 Feb 1933) He married Anna E. Kempter (born Kickapoo) on 9 May 1911. 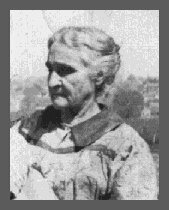 (8-7-9) Cornelia Caroline Brown dau of Gideon Leeper & Matilda (Patton) Brown was born 26 Jun 1851 Platte, MO an died 3 Mar 1898 . She married in 1869 Rufus Morgan Maget ( b 1810 TN son of John and Nancy (Martin) Maget. (8-7-9-1) Josephine Maget married Gideon Leeper Brown ( b 1861, son of Gideon Leeper & Elizabeth (Sharp) Brown. Sedgewick, KS & died 30 May 1985 Smithville, Clay, MO. She married 25 Dec 1915 O.C. Cogdill (b 8 Jul 1892 Wallace, Buchanan Co., MO). (Gower) Erikson (b 2 Aug 1967 Kanss City, KS) 29 Jun 1991 Cameron, Clinton Co., MO. (8-8) James L. Brown, son of Felix C & Jane was born before 1803 and died before 16 Dec 1870. He married Rebecca Weaver. (8-11) Hugh Leeper Brown »«, son of Felix C & Jane, was born 24 Jun 1810 in Knox Co., TN, and died at age 78 on 23 Jan 1888 Brownsville, Linn Co., OR. 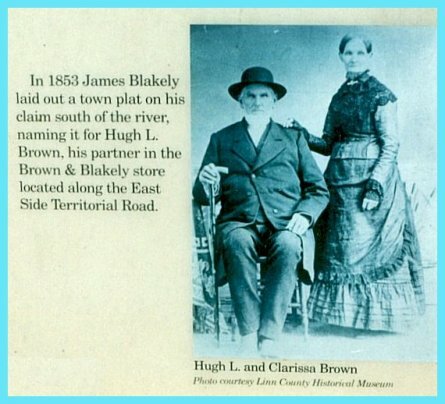 He married Clarissa Browning (b 8 Feb 1810 VA d 8 Apr 1898 Brownsville, Or) 11 Nov 1828. They were Oregon Trail pioneers who left TN circa 1838 and settled temporarily in Missouri before settling in Brownsville circa 1846. They traveled there by oxen team with Hugh's nephew James Blakely (b 1812). The town of Brownsville was named after Hugh who had the first store there. There is a museum & genealogical library there. They have pictures of Hugh and Clarissa as well as copies of land grants & pioneer stories. The town is quaint and several movies have been filmed there including the Rob Reiner film, Stand By Me. Many of the original structures are still standing. 8. Amanda b 1847 Brownsville, Linn Co., OR d 6 Nov 1936 Portland OR m Nelson J. Cochran 30 Dec 19?? Amelia fell from a horse, and we assume, must have broken her pelvis, and was confiend to bed for twenty years, durint the time Earl and two other children were born. The other two died in infancy. Montgomery 5 Mar 1850 Linn Or. They homesteaded on the north side of the Calapooya and later in trade with Grandfather Brown, acquired the north side of the Brown claim, building ahome among the oak trees. 1. John m Elizabeth Couey - 4 children both parents shot to death by their son Lloyd while the other children were at school. He was hung at the Albany Courthouse. 3. Hugh Leeper m Jane Lesley had son Hugh who made Navy his life's work and one other child. Jane left family and married someone else. (8-11-2-10-4) Mabel Lois Montgomery was born 3 mar 1915 and died 1990 Ca. She marriedChester Sherman Hayden (b 1910 SD bro Ray Hayden). Mabel and Chester were divorced and she married Maurice J. Reese who adopted first two children and they had two more. (8-11-2-10-4-1) Howard Chester Hayden Reese was born 7 Nov 1931 OR. He married Emily Natalie Angellotti 13 Feb 1954 Ontario CA. They live in Irvine, CA. He retired as President and CEO of Western Financial Savings Bank of Irvine, CA and continues to serve on the Board. Guasti, Ca) and they live in Moorpark, Ca. John is in the Telecommunications field and Melanie is employed by time in the Health Services Depot of her local school district. CA). He is in the informations systems/computer business. He and his wife Lisa live in Irvine, CA. 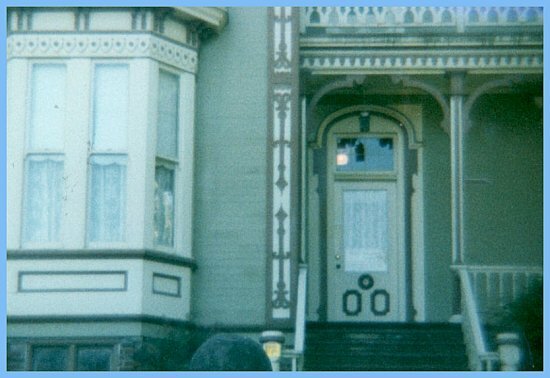 (8-11-5) Elizabeth Devine Brown was born 1840 MO d 30 May 1921 Portland, OR. She married John M. Moyer 4 Jun 1857 Linn Co., OR. The Moyer home is now a museum »«. (8-11-7) Missouri Ann (Zuri) Brown b 1845 MO and d 22 Feb 1915 Bronsville, Linn Co., Or. She Married John Tycer 30 Dec 1862 Linn Co., OR. 2. Leonard b 11 Jan 1965 d 16 May 1904 m Alda Vennum no ch. 3. William O. 25 Sept 1868 - 2 Nov 190? d never married Spanish Amer. War Vet. 8-11-8). Amanda Brown was born 1847 Brownsville, Linn Co., OR d 6 Nov 1936 Portland OR m Mr. Krager. 1. Gladys m Redfern ch Donald, Stanley, Adelle, Dale P, Dr. Melvin L.
(8-12) Thomas A Brown, son of Felix C & Jane, was born 28 Jan 1812 in Knox, Tenn and died 13 Jan 1901 at St. Joseph, Buchanan, MO at age 89. He was a Judge. He married Margaret Devine Blakeley (b 1815 d 16 Sep 1862 Nodaway, MO) on 21 Apr 1833 Jefferson, TN. 4. Joseph A. b 1839 Nodaway, MO, died before 1900 m. Eliza E.
7. Napoleon B. "Nip" b 1848 died Dec 1872 m Mary Blakely. (born 1815 Bourbon, Kentucky) on 9 Nov 1873 Buchanan, MO. (8-12-3) Elizabeth Brown S. b 1837 Knox Ten died May 1916 at age 79 m Chas Haltibridad Dec 1856 Her next marriage was to Nathan B. Lane (b 1867 St. Joseph, MO). (8-12-3-1) Nancy Lane didn't know who her mother was as she was about 6 when Nathan Lane married Elizabeth Brown and he disappeared in 1894. Elizabeth Brown Lane divorced him in 1902. Anna Morris has some information on Elizabeth Brown Lane because her mother's parents bought her farm in Nodaway Co., MO in 1918 and lived there the rest of their lives until their deaths in 1964. She also has her obituary from the Barnard Bulletin dated May 25, 1916 and a Biographical Review from "Past and Present of Nodaway County, Missouri 1910". (8-12-4) Joseph A. Brown b 1839 Nodaway, MO, died before 1900. He married Eliza E.
(8-12-5) Gideon Leeper Brown b 26 Jul 1841 Dearborn, Platte, MO and died 26 May 1877 (another source said Aug 1933 Wallace, MO at age 92.) He married Nancy Amanda Maget, daughter of John and Nancy (Martin) Maget on 8 Mar 1866. She was born 12 Dec 1844 and died 10 May 1879. (8-12-5-1) Emma Lea Brown was born 1867, She married Henry Bledsoe. (8-12-5-3) Nancy (Nannie) Brown was born 1873. She married Mr. Atkinson. Josephine Maget on 11 April 11 Apr 1888 in Dearborn, Platte Co., MO. Josephine was born in 1870 in Crawford Township, Buchanan Co., MO to Rufus Morgan MAGET and Cornelia Caroline BROWN. In 1916, Josephine died in Missouri. Gideon Jr. died in 1913. They had eight children. (8-12-6) Thomas Jefferson Brown b 7 Sep 1844 in Barnard, Nodaway, MO d 21 Dec 1916 St Joseph, Buchanan, MO. M. Sarah Eugina Leonard 10 Dec 1865 Buchanan, MO.